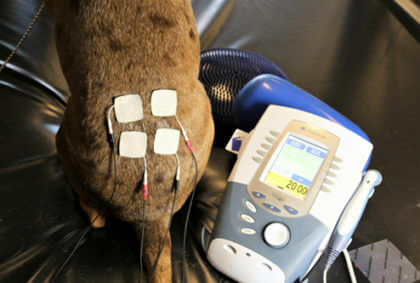 Electrostimulation Therapy, or Neuromuscular Electrical Stimulation (NMES), is the electrical stimulation of muscles or the nerves that feed muscles. The purpose is to make the muscle contract. This contraction of muscles is necessary when there is nerve damage to the brain, spinal cord or other nerves that feed the muscles. This is additionally necessary in cases when they cannot move on their own, or where there is trauma or surgery to the bone, joint, or muscle that makes it too painful for the muscle to move without electrostimulation. NMES electrodes are placed on the rear limbs to stimulate normal muscle contracture while waiting for the spinal cord to heal. In pets with Intervertebral Disc Disease (IVDD), loss of 50% of the muscle mass of the rear leg muscles occurs within 3 weeks of spinal cord injury. With NMES the muscle mass can be returned to near normal size. The muscles that have lost neurologic function can regain up to 33% of their strength with NMES. With stem cell therapy, the movement of the muscles sends neurological impulses to the spinal cord. These impulses reach the damaged area and the stem cells within the damaged area, stimulating them to repair nerve function. This repair comes in the form of chemicals released from the nerve endings. These chemicals are called cytokines. Cytokines stimulate local stem cells to adapt to the needs of the tissues, resulting in healing. Pain control with transcutaneous electrical nerve stimulation (TENS) is different from NMES in that the electrical stimulation is to the skin with TENS, and to the muscles and nerves with NMES. When TENS is applied to the skin, large nerve fibers (A-β) are stimulated. These A-β fibers connect to other nerves traveling to the brain in the spinal cord and stimulate nerve fibers that block the perception of pain in the brain. This is called the gate control theory of pain. The frequency of electrical impulses that stimulate the A-β fibers also causes the release of endorphins from the pituitary in the brain. Endorphins are natural narcotics that produce pain relief when released. The nerve connections in the spinal cord also stimulate another nerve fiber (A-δ). A-δ fiber stimulation blocks nerves headed for the brain and are also involved in the mechanism of action for acupuncture. The effect of TENS is like the effects of acupuncture for pain control.